I’m a big fan of bullet journals for tracking all aspects of my life. I have a planner for my everyday appointments and calendar, but I use my bullet journal to keep track of important things in my life. Also, want to start a bullet journal but on a tight budget? Check out my Complete Guide to Cheap Bullet Journal Supplies for thrifty ways to start a bullet journal! One very important area of life to keep track of is your finances! 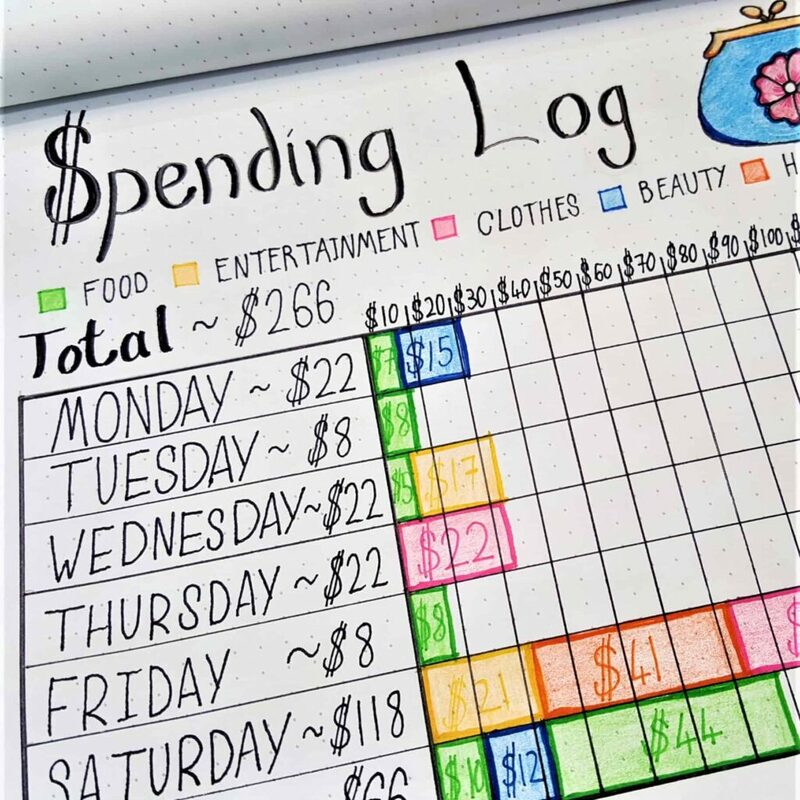 Here are some ideas for keeping track of your bullet journal budget and money saving. 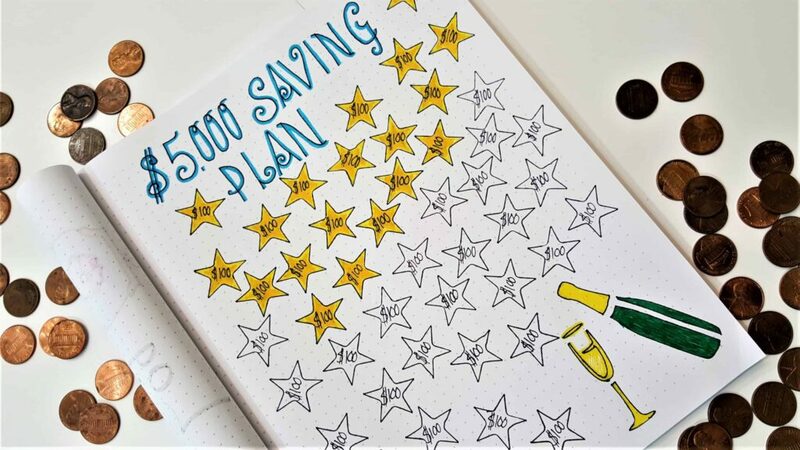 There’s a lot of ways to keep track of savings. I decided to draw a piggy bank and “fill” him up as I reach my savings goal. Green seemed the perfect color to fill the piggy bank, after all, it’s the color you associate with money the most! I used to love filling my piggy bank with coins and then opening it up to see how much I had saved! 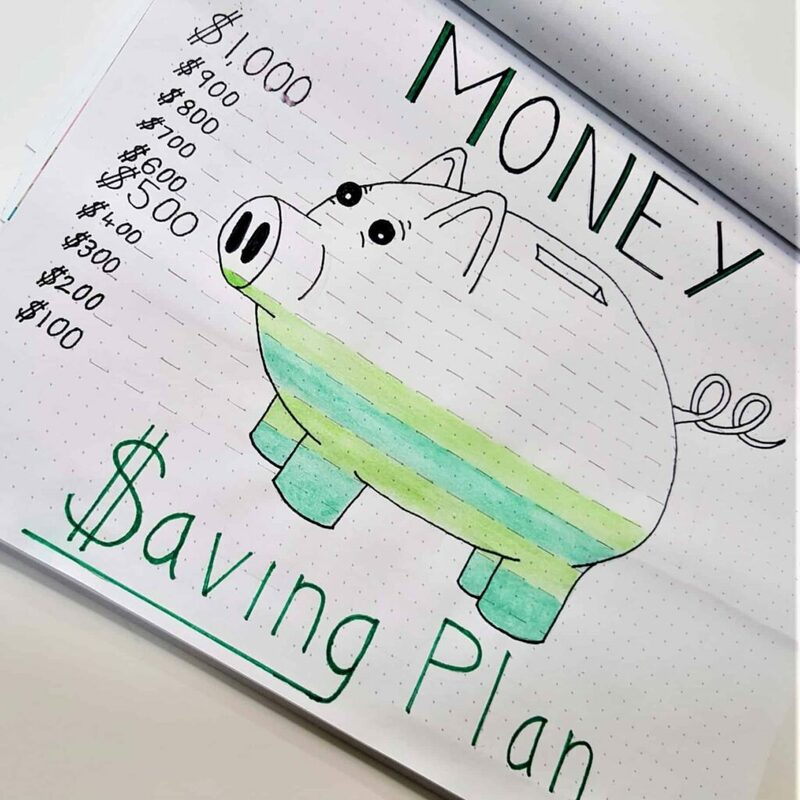 This is a fun way to keep track of any money goal – paying off a debt, saving money or expenses. An important part of managing your finances is to keep track of your spending. I like to track my spending every week, as it gives me a better idea of when I’m spending too much. I use a weekly tracking spread to break down exactly what I’m spending my money on and how much. Bullet journal budget tracking is so much more fun than normal! This way you can see exactly how much money you spend each week and on what. It makes it easy to see where you can cut back on your spending. I can see from this weekly spread that I spend far too much on eating out, especially my Starbucks fix in the mornings! 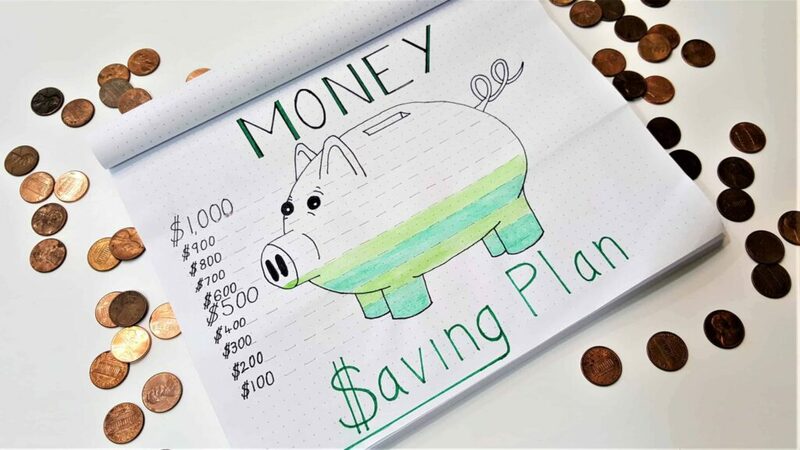 It takes a bit of work each week, but even if you just do it for a few weeks, it will make a big difference to your budget. This is a page that I will return to again and again of the course of the year. 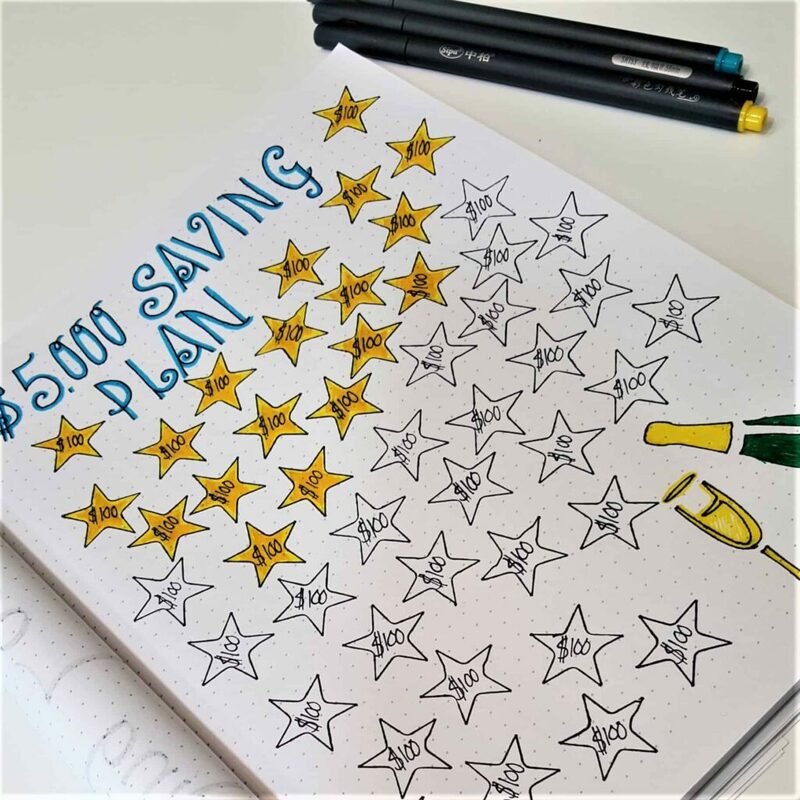 Coloring in a start every time I add another $100 to my saving accounts. You can see I added a little champagne bottle to the bottom corner of the page. It really will be a celebration when I reach $5,000! I love using trackers where I color in shapes as I progress towards my goal. It gives such a satisfying feeling to see the page slowly fill up. 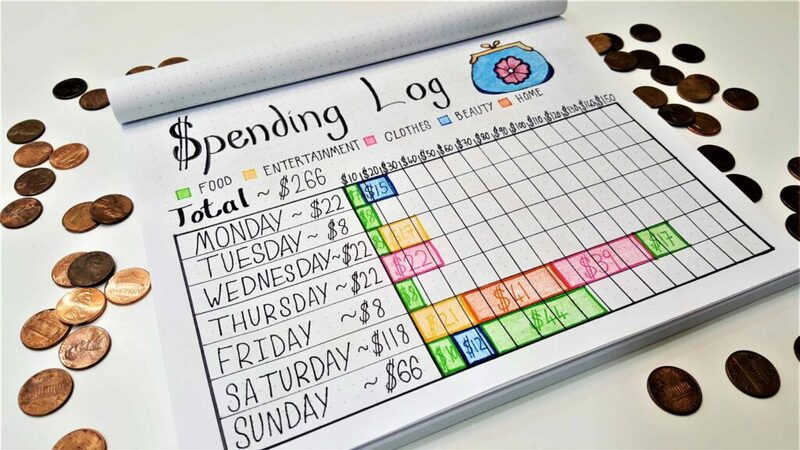 That’s how I use my bullet journal budget to keep track of my finances. How do you like to use your bullet journal? I’d love to hear your ideas below in the comments section.